While you can learn some of these at a Bartender School, never before have they appeared all in one place. Sign up for Bartending Classes today at American Bartender School in NYC and you can learn how to master these drinks and keep your customers coming back for more. We will get you a Bartending License and help you find a job! Shake and strain into a shot glass. Garnish with 3 peanuts. Fill glass with ice. Pour Butterscotch Schnapps and Bailey’s into the glass. Fill with Milk. Shake. Serve with sip straw. Fill a shaker with ice, pour in 2 ounces of cognac, add equal parts of a coffee liqueur, an almond flavored liqueur and an Irish cream. Shake it all together and strain it into shot glasses. Garnish with shavings of chocolate. Pour ingredients into a cocktail shaker with ice. Shake well and strain into a shot glass. Place ingredients in shaker with ice, shake and serve in a shot glass. Pour all liquors into an iced tin then shake and strain. Last drop a peanut into the shot glass. Shake over ice. Salt half the rim. Let mixture sit for 2 days to a week. Add the vodka to the bottle. Boil some water, and add to a pot/bowl/jug big enough to fit the bottle you are using to make the vodka in. Place the bottle in the boiled water, and give it a shake every now and again to mix the chocolate into the vodka. Serve in shooter glasses, once the chocolate has completely melted into the vodka. Shake over ice. Drizzle honey and chocolate in glass, fill with ice and serve. Chill a shot glass while you mix the drink. Shake over ice and strain into your chilled shot glass. Shake over ice. Drizzle dash of blue curacao on sides of the glass. Serve. Shake over ice to make 2 Shots. Sprinkle sugar on lemon wedge. Bite into lemon (just like with a tequila shot!) Shake over ice and coat shot rim with sugar. Mix the sugar into the cream stirring until the sugar dissolves and turns the cream blue. Add two drops of neon food coloring to kick it up a notch. You can opt to use green, pink or yellow to coordinate with your Peeps candies. Pour a small amount of colored cream on a plate. Pour non-pareils on a second plate. Dip edge of martini glass into cream to wet. Wipe off any excess that drips below edge, leave edge wet! Dip wet edge into non-pareils and coat. Add vodka to colored cream and stir. Pour into glasses. Use a knife to cut a slit into Peep and place on edge of glass. Come liqueur and vodka into shot glass. Drop shot into pint glass of Red Bull. 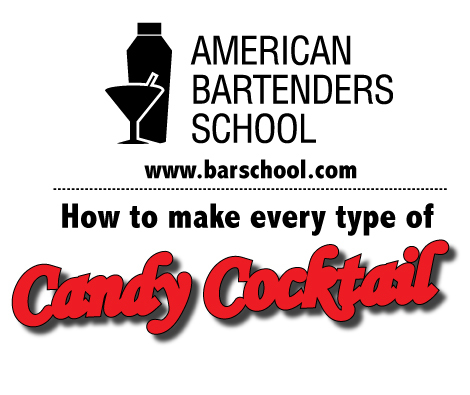 This one is a favorite of the Bartender Schools! Shake over ice and garnish with lime. Next Next post: What the heck is Angostura?